In January, when the Obama administration came out with its ambition of a military "pivot" to Asia, it caused confusion and unease in the region. Earlier this month, speaking at the Shangri-La Dialogue in Singapore, which was attended by most Asian defense ministers, US Defense Secretary Leon Panetta eschewed the term "pivot" and referred to a "rebalancing" toward Asia. Although Panetta said that the renewed US interest in the Asia-Pacific region was not aimed at China, "few in the audience said they believed it," according to a recent report in the New York Times. India is very much interested in US military technology and, therefore, keen to upscale defense cooperation. Therefore, when India did not come out cheering the new US Asia strategy and Panetta's pitch in Singapore, it was assumed that India's restraint was to avoid raising China's hackles. For this, the US has itself and Panetta's overblown rhetoric to blame. By describing India as the "linchpin" in the US strategy of "rebalancing" toward Asia-Pacific, Panetta forced his hosts to clarify that India could never be locked in as an integral part of someone else's strategy. As Panetta said in New Delhi on June 6 "America is at a turning point. After a decade of war, we are developing a new defense strategy - a central feature of which is 'rebalancing' toward the Asia-Pacific region. [...] Cooperation with India is a linchpin in this strategy." 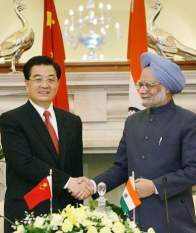 The same day, on the sidelines of the Shanghai Cooperation Organization summit, Chinese Vice Premier Li Keqiang assured the India's External Affairs Minister S.M. Krishna of working together to maintain strategic communication, improve mutual political trust and appropriately address disputes and safeguard the peace and tranquillity in border areas to advance bilateral relationship to a new phase. The Indian media's focus on both the US and China wooing India with such fervor could not have been flattering to Washington and Panetta's high-power delegation. Besides, Li and Krishna putting Panetta in the shade, both Indian Prime Minister Manmohan Singh and Defence Minister A.K. Antony conveyed their reservations on the "rebalancing" strategy to the visiting US defense secretary. Antony, too, impressed on Panetta that the US needed to recalibrate or rethink its defense policy. He underscored the need "to strengthen the multilateral security architecture" in the Asia Pacific and that it must "move at a pace comfortable to all countries concerned." 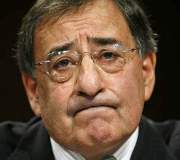 Leon Panetta, US Defense Secretary and idiot!